On May 27, 2016, Schmooze returned to Maison Mercer for another year of the city’s best after-work patio parties from 5-9 p.m. Belvedere sponsored the event as guests enjoyed $4 drink specials and a complimentary barbecue. Guests beat the heat with mojitos, pitchers of sangria and five-pack buckets of Sol for $25. Schmooze is Toronto’s favourite after-work patio for both young and established professionals in the downtown core. 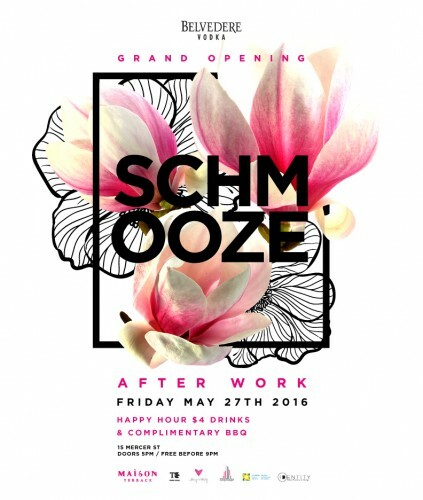 With drink sponsors and prizes to be won, Schmooze is the best, weekly, after-work party! Join us for the next Schmooze on June 17, 2016!